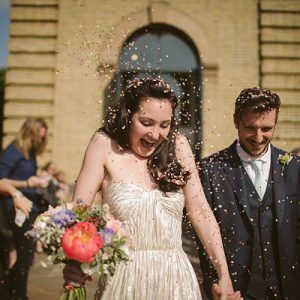 You will know today’s DIY bride from her regular Diary entries in Diary of a Boho Bride, it’s the lovely Rachel! With only a few weeks to go before her wedding Rachel is putting her plans into actions and ticking off all those last minute jobs. As well as catering for the whole wedding herself! (Yes I know!) Rachel has decided to have her own Sweet Buffet, and yes you guessed it she is making all the sweets herself! 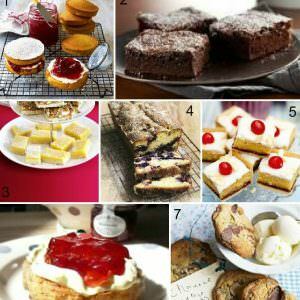 So today Rachel is sharing with us a few sweet recipes. I’ll pass the blog over to Rachel……………. 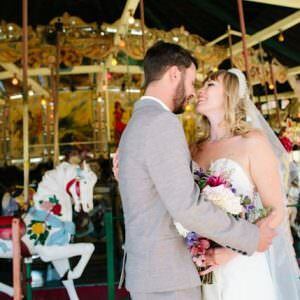 One of the things I’ve seen again and again on wedding blogs that I really love is the candy buffet. 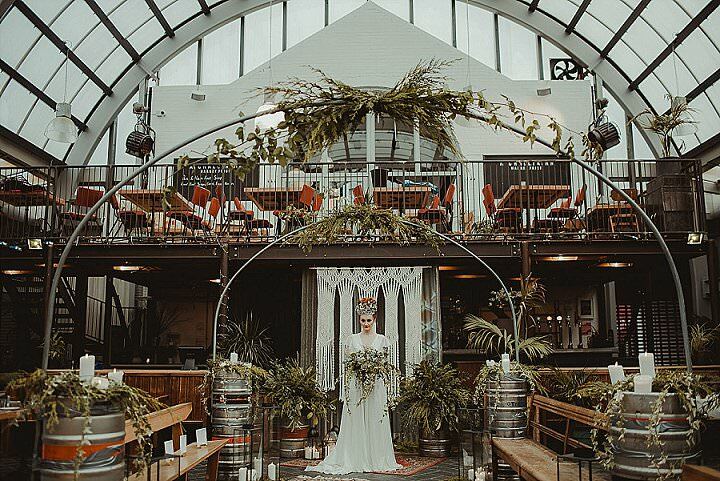 It’s colourful and it’s fun – so we decided it definitely fitted in with our wedding theme! But we thought we’d have a go at making the sweets ourselves – so my big sister and I put our heads together and starting plotting sweetie making fun. 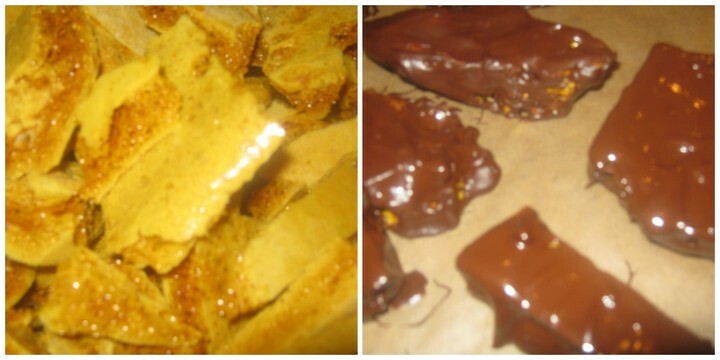 I thought I’d share some of the successful recipes I’ve tried so far and which will be featuring on our candy buffet. 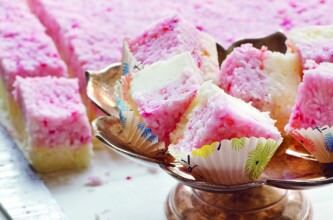 If you’ve got any tried and tested sweet recipes to recommend, I’d love to hear about those too! Tip the sugar, butter, milk and evaporated milk into a heavy based pan and heat gently, stirring frequently, until the sugar has dissolved. Then bring to the boil without stirring, and continue boiling until a temperature of 116°C (240°F) is reached on a sugar thermometer. If you don’t have one of these, you can test if the fudge is at this temperature by spooning a small amount of the syrup into some iced water, it should form a soft ball. As the temperature rises, stir the fudge occasionally (be careful as the mixture is very hot) so that the sugar doesn’t stick and burn. Remove the pan from the heat, add the vanilla extract and beat the mixture with a wooden spoon until thickened. Pour into an 18cm (7in) shallow square tin brushed with a little vegetable oil, and leave for 10-15 mins or until almost set. It will set quicker in the fridge. 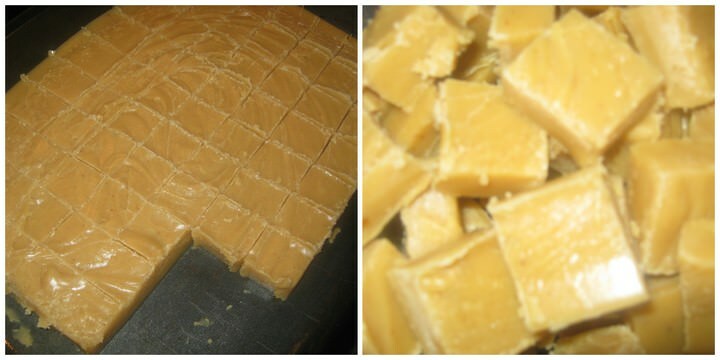 Mark the fudge into 36 squares with a sharp knife and leave to cool completely. 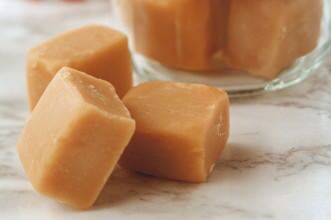 I used this recipe for my vanilla fudge and it worked really well. 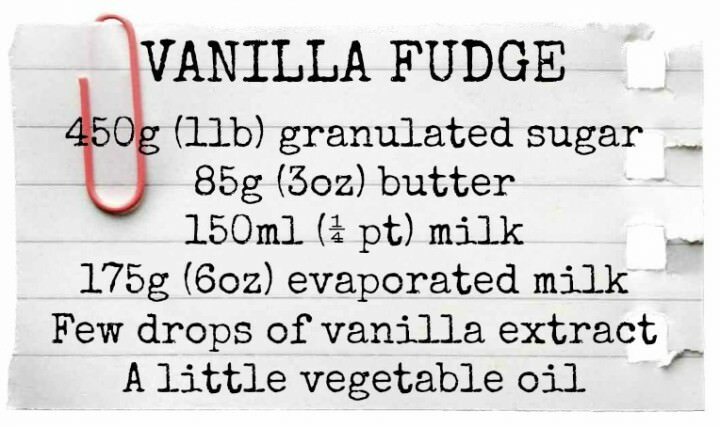 BUT – I tried it using a sugar thermometer and if I’d just relied on that the fudge would have burned. 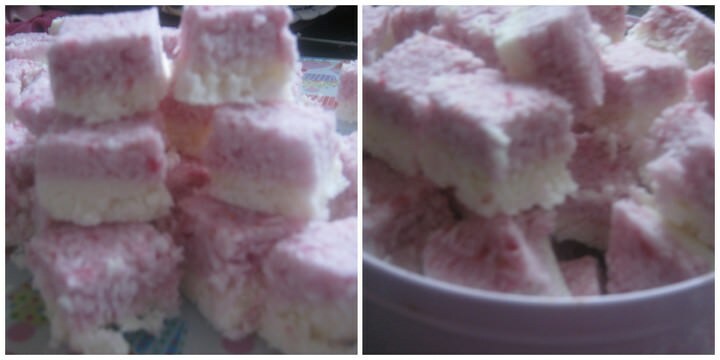 It was all about using your instinct and paying attention to the texture and colour of the fudge in the pan. On a health and safety note, don’t be naughty like me and stick your finger into very hot liquid fudge… it’s tempting, but it’s not a good plan! Line an 18cm square tin with non-stick baking paper. Make the white ice first by beating half the sugar with the mascarpone until you have a smooth runny paste. Stir in the coconut and remaining sugar, mix well then press into the bottom of the tin. 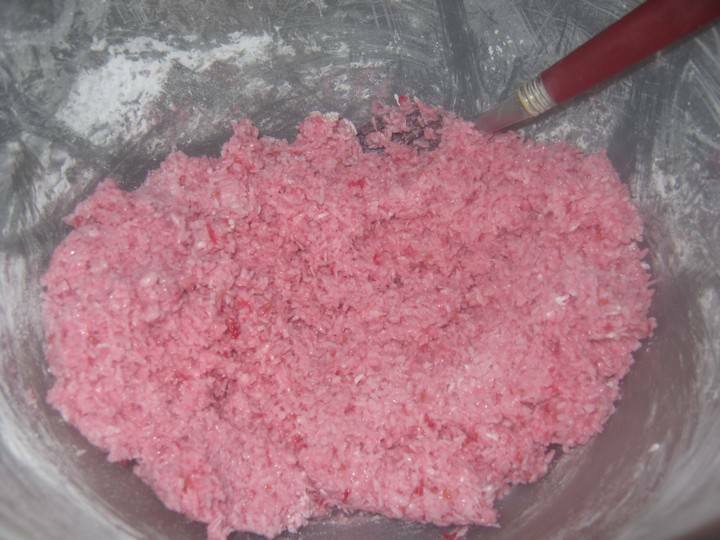 Pack the mixture in well and smooth the top. For the raspberry mixture: Squish the raspberries with the mascarpone and half the sugar until smooth. You can sieve the seeds out if you like. Then stir in the coconut followed by the last of the sugar. Spread this carefully over the white ice until you have it even, then press it down firmly with a spatula and your fingers. Loosely cover the tin, with the top of the ice exposed to the air slightly, and leave overnight somewhere cool to firm. The following day, lift out of the tin by the lining paper and cut into pieces. I used this recipe for this one. 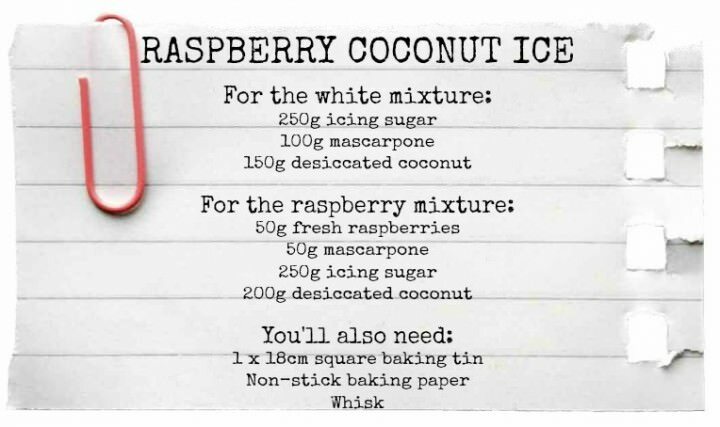 It says it serves twelve but I think that would be twelve people living off coconut ice for two days – it made loads! 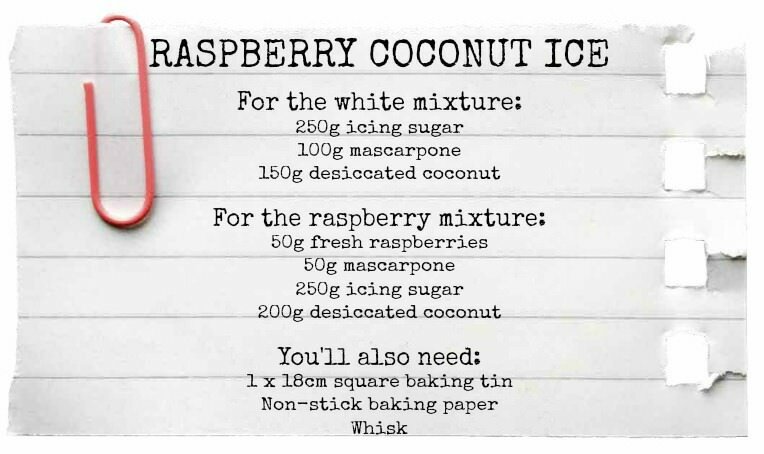 This one is so easy to make, and has a nice twist on your standard coconut ice with the fresh raspberries mixed in. It’s just so pretty, too. Firstly, line a baking tray (a shallow one if you have it) with parchment paper. 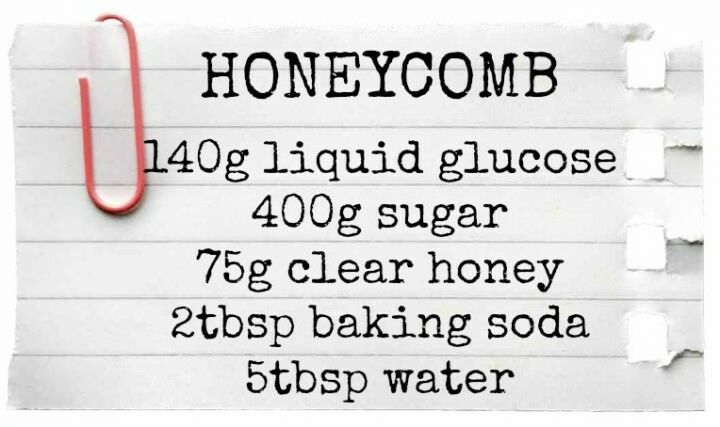 In a large saucepan (heavy-based ones are best), put the liquid glucose, honey, sugar and water. 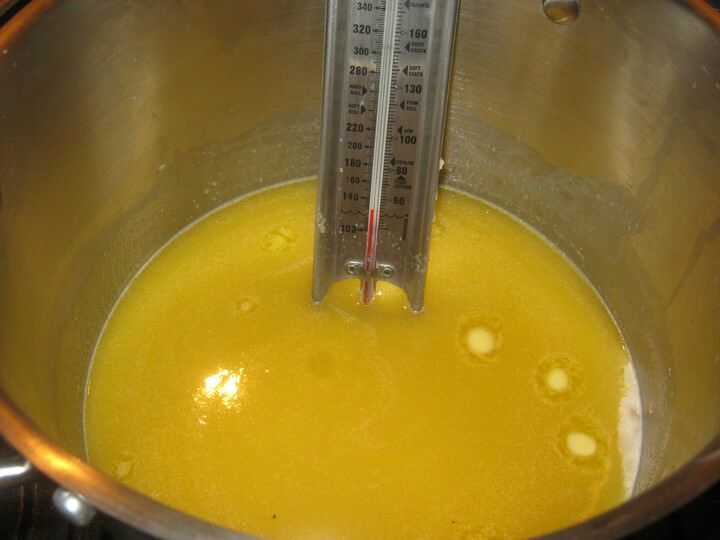 Heat the mixture gently and stir from time to time until you see the sugar dissolving. Turn up the heat and let the mixture cook until you see it transform into a light golden colour. When it changes colour, blend in the baking soda – you’ll see the mixture turn into a foaming mass and at this point, pour it into the parchment paper-lined baking tray. Let the mixture cool for about an hour. When it has cooled, break up the honeycomb using the end of a rolling pin. You can store the honeycomb in an airtight jar until you need it. Cook’s tip: Liquid glucose is widely available in most large supermarkets. 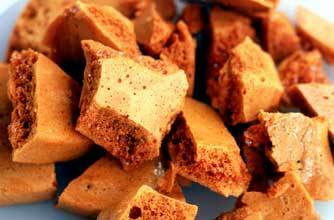 Possibly the most fun you can have in a kitchen has to be making honeycomb. After trialing a couple of recipes, this one () worked the best for me. It is SO much fun to pour in your bicarbonate of soda and watch everything billow up. I covered my honeycomb in dark chocolate, making it taste like a posh Crunchie – and with the added benefit of the chocolate keeping the honeycomb crispy. I’ve also got plans to serve up white and dark chocolate truffles, and I would love to serve homemade Turkish delight (but my experiments in that so far haven’t been perfect texture-wise). 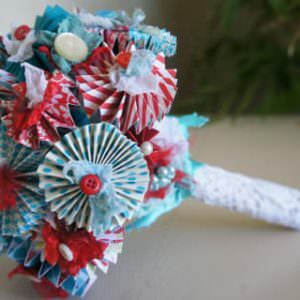 Of course, it’s a rainbow wedding, so I may also give into the temptation to buy in some Smarties!